How popular is the baby name Tamar in the United States right now? How popular was it historically? Find out using the graph below! Plus, check out all the blog posts that mention the name Tamar. Five-Name Friday – The Return of Suggestion Posts! Update, 6/21/2017: Check out the Need a Name? page. The people have spoken! Well, not all the people. Only those people who voted in the poll that was sitting in my sidebar for about a month. In any case, those specific people spoke. That is, they voted. And what they voted for was a weekly baby name suggestion post. But here’s the thing: I’m not going to do in-depth suggestion posts this time around. 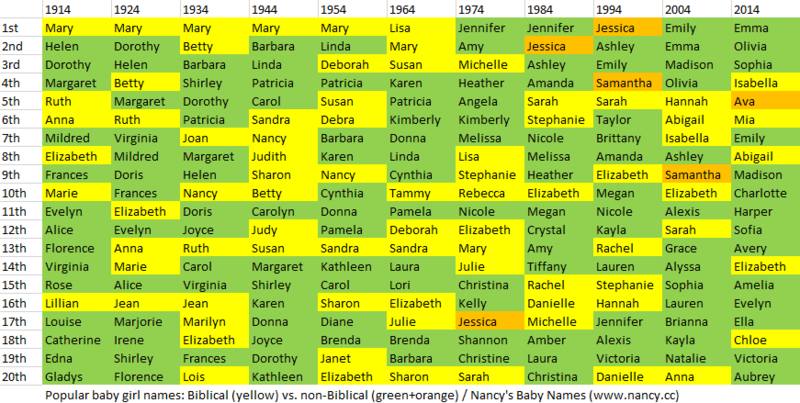 What I’ll do instead is focus on simplified baby name requests (up to 2 sentences each) and limited baby name suggestions (up to 5 from me, and up to 5 from every commenter). My hope is that these constraints will make participation easy and fun, like a game. You don’t have to be pregnant, or even planning to get pregnant, to place a request. And you can send as many requests as you like — either separately or all in the same email. After you’ve sent a request (or several), subscribe to the blog. That way you can keep tabs on all future Five-Name Friday posts and see which requests get featured. Will one of them be yours? We can’t start suggesting names until next Friday, so I’ll hold off on these guidelines for now. Update, 8/30: Here’s the ever-growing Five-Name Friday archive!